The book that refreshed the vampire comic 'Redneck' is back with the start of another arc and it doesn't disappoint. Donny Cates is a mad genius that lulls you with exposition and character moments before whacking you on the head in the end. Issue seven picks up eights months after the Bowmans' daring escape from the law with newly turned Landry in tow and living in hiding. Living off the land and in much humbler accommodations isn't foreign to the Bowmans as they're making do just fine. Landry, on the other hand, is still adjusting to the vampire life. One that depends on pig blood to survive and whatever rules that lifestyle entails. He's determined to learn them all and he makes sure to go down the list of every vampire trope in the book. Bartlett obliges him as they stroll through the woods and answering and dispelling some of the most common misconceptions. Cates mixes homespun exposition, great dialogue, and the characters themselves reveal so many emotions. Landry's curiosity, Bartlett's compassion, Seamus' impatience, and J.V. 's paranoia all paint a picture of a family that's on edge, restless, and in limbo. Of course, things take an unexpected turn and the Bowmans won't be the same again. Lisandro Estherren has his work cut out for him with the amount of dense forest he has to pencil for the entire issue. His scratchy line style lends itself well to the variations found in a woodsy area full of grass, plants, and branches. Dee Cunniffe provides the great warm colors that fill the trees and leaves and the moonlit skies of Waco, Texas. They combine their unique art, culminating in one heart-stopping splash page. 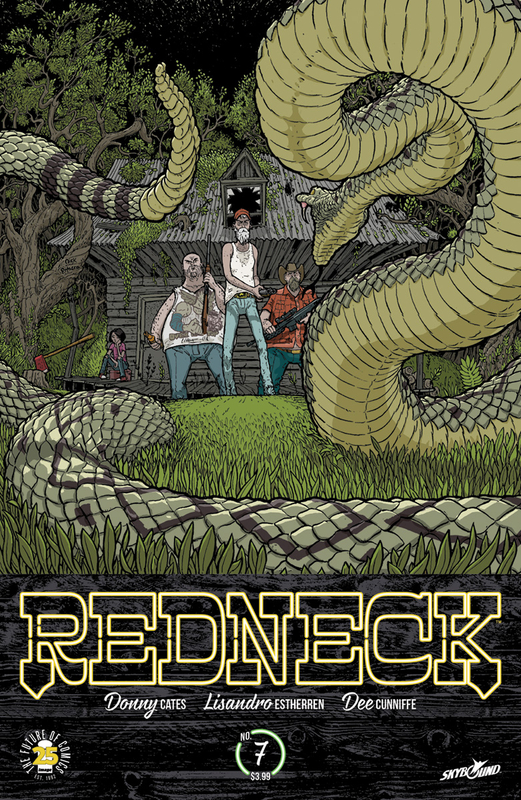 'Redneck' is back with another stirring chapter in the saga of modern-day vampires on the run. The Bowmans may have avoided the law but they'll be forced to face a new threat. Cates, Estherren, and Cunniffe continue to impress with solid storytelling and dramatic twists making this a monthly must-read.